The story of what happened to Japanese Americans shortly after the United States entered World War II never ceases to stun me. 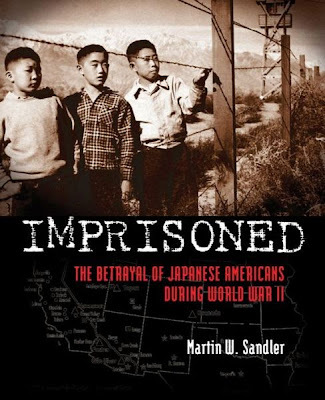 And, as Martin Sandler shows in his newest nonfiction book, Imprisoned, it is especially ironic that while we were fighting a war to save democracy, we had no compunction about taking it away was a whole section of American society by placing them in internments camps scattered throughout the US, located out in the middle of nowhere. But, as Sandler points out, fear and mistrust of Japanese immigrants to the US didn't begin with World War II. And so, we are given a short history about the arrival of the Japanese; their willingness to take any kind of work when they first arrived here; how they saved their money and how they were eventually able to afford their piece of the American Dream. But they looked different, their language was different, their religion and culture were different and so they faced anti-Japanese signs and sentiments all over the West Coast. As more Japanese arrived, laws were passed preventing Japanese immigrants from owning law, then congress passed the Immigration Act, which banned Japanese immigration to the US altogether. And of course, according to The Naturalization Act of 1790, citizenship was already out of the question for any non-white not born on American soil. Yet, despite all of these obstacles, Sandler points out, the Japanese still managed to thrive in this country. That was until December 7, 1941, when the Japan attacked the United States in Pearl Harbor, Hawaii. Once again, fear and mistrust reared up. And, despite the fact that there was no indication that the Japanese and their Americans born children were the least bit sympathetic to or in cahoots with Japan, it didn't take long for the hate and suspicion mongers to convince the President of the United States to sign Executive Order 9066 placing them in internment camps. In this relatively short (176 pages), well researched, well written book, Sandler gives us tells the story of life in the internments camps through personal accounts and interviews never before published, all supplemented with a abundance of photographs, providing a more in-depth look at what went on before, during and after the war. It was a little difficult reading this book because it was from Net Galley and I downloaded it to my Kindle App and the photos weren't where they should have been and the wonderful personal accounts that are included were also kind of helter-skelter so I am very anxious to see and reread the actual book when it comes out on August 27, 2013. Despite my difficulty reading Imprisoned, I would still highly recommend it to anyone interested in WW2 home front history. A nice companion book, which Sandler also mentions is Citizen 13660 by Miné Okubo, which I review back in 2011. The story of internment of Japanese and Japanese Americans didn't end with WW2. Given $25 and a ticket home, Sandler goes on to briefly cover how the internees returned to their homes to find everything gone, how they worked hard to get back on their feet yet again,despite yet more obstacles, and finally, their fight for reparations in the 1970s and 1980s. There is copious back matter including places to visit, websites with additional information and a nice in-depth index (one of my favorite back matter elements that often is not as well done as this one). I think one of the saddest aspects of this whole sad chapter in American history is that Japanese were imprisoned mainly because the looked differently. We didn't imprison Italians or Germans (despite the high pro-Nazi sentiments many Germans living in America felt).